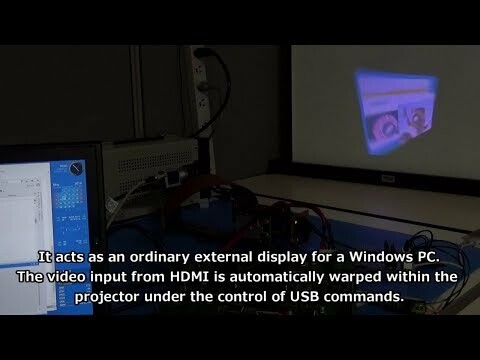 A Full-Color High-Speed Homography Warping Projector - Hashimoto-Kagami Lab., Tohoku Univ. We present a full-color DLP (Digital Light Processing) projector that enables fast projection mapping onto a moving surface. It receives normal video input from HDMI and warps the image at over 2400 transforms/sec under the control of USB commands. In general, DLP projectors represent an image as sequential superposition of binary patterns. Our projector applies image warp to each pattern (Kagami+, SIGGRAPH Asia 2015), instead of a set of patterns composing a video frame. Therefore, quick response to motion commands is maintained. Copyright © 2008-2018 Hashimoto & Arai Lab. / Kagami Lab., Tohoku University.